This week we spoke about gardening as a profession. 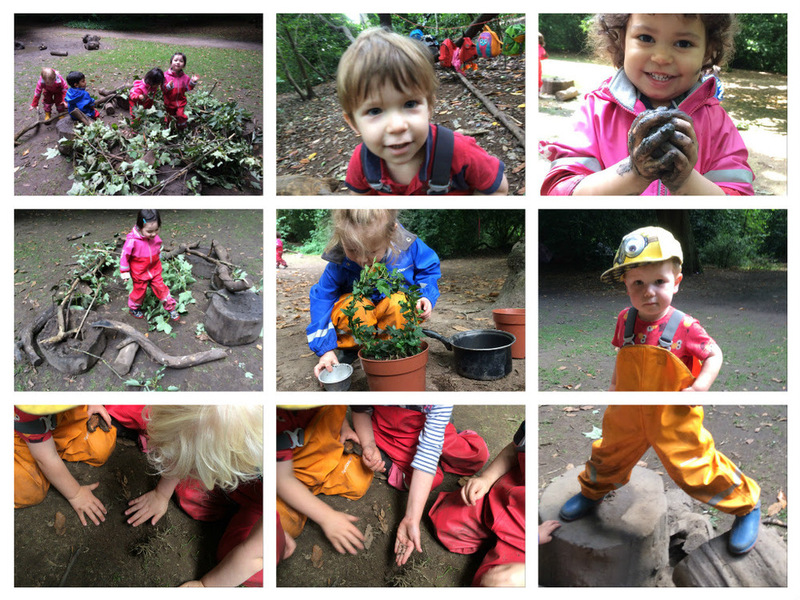 The children planted and explored plants with gardening materials such as trowels and gardening gloves. We learnt about wreaths and how to plant using pots, spades, seeds and plants with Ama. This is good practice for when we have our new veggie patch at CHHG greenhouse. Arturo created a climbing fame for the children. He piled up logs and big sticks to challenge the children’s climbing ability. The children found it exciting to climb and jump off of our homemade climbing facility. The children have been finding feathers in the forest recently. They are intrigued to find a variety of colours on the different feathers. They suggest where they think the feathers have come from. When the children find things they like in the forest they ask if they can put it in their bags to take home to show their parents. Whether their treasurable items arrive home or not is a different story. One of the children found a cricket which wasn’t moving. The children chose where they wanted to dig a hole and all helped each other. One child placed the cricket in the hole while the others covered it with soil. They did this with much love and care. It was heart-warming to see the children show affection and empathy towards a creature. We have previously been making dens in the forest using hessian rugs. This week the children got involved in a big project and they decided to make a huge den using branches that had been cut off of trees by the gardeners. The children courageously dragged branches across the floor to the base of their den and piled the branches on top of each other. Next week we will be carrying on with the topic People Who Help Us. We would like for parents to talk to children about their own professions as we will be discussing this during one of our circle times. This will also help to elaborate on the topic. We’ll be visiting the circus on Monday too. Very exciting!